This classic bronze sculpture is probably the most famous statue in the world. 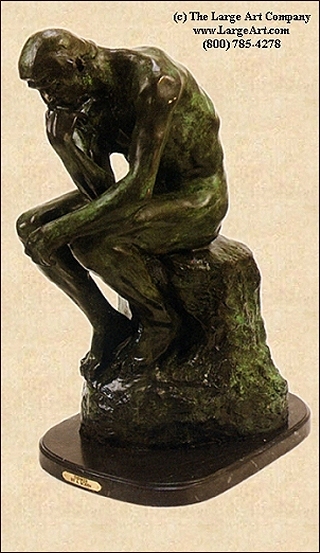 Created by Auguste Rodin in the late 1800's. There are two sizes of this sculpture available. The large version measures 29" high x 17" wide. Perfect for a coffee table or credenza. Sure to make an impression. The smaller size is also nice and measures 10" tall x 6" wide. Either size can be done in the Verdi green or classic brown patina (color). We also have a life-size version of this sculpture as well! Click here.